without the headship of a man. Both men and women have no legal right to approach God without the headship of a high priest. Under the Old Covenant (Old Testament), kingship was of the tribe of Judah, and, strictly separate, priesthood was of the tribe of Levi. And Aaron (high priest) shall make an atonement upon the horns of it once in a year with the blood of the sin offering of atonements: once in the year shall he make atonement upon it throughout your generations: it is most holy unto the Lord. Under the New Covenant (New Testament), Jesus Christ is our king of kings and our high priest by the order of Melchisedec. Men are both kings and priests by the order of Melchisedec. That is, kingship and priesthood are no longer separate. And, access to God via priesthood is available to all people, not just Old Covenant Jews, via our High Priest: Jesus Christ, and our priesthood of all Christian men. 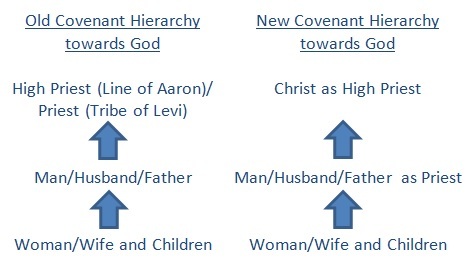 But women’s roles are the same under Old and New Covenant. In the beginning, God gave Adam one commandment: not to eat of the tree of knowledge of good and evil. Interestingly, God only gave this commandment to Adam (before God created Eve). Eve knew about this commandment because of Adam. Because she did not take her husband’s word as the Word of God, this began the fall. Is this because every husband is a Biblical scholar? No, it is because of spiritual law. Women must approach God via the appropriate channel. They are to submit to their husbands. When the woman at the well asked Jesus for his ‘living water’, Jesus insisted that her husband would lead. But women’s vows to God must go through her father (in her youth) or husband. …Every vow, and every binding oath to afflict the soul, her husband may establish it, or her husband may make it void. If men are not Christians, wives need to win their husbands to Christ, but still are under the husband's headship. Even if a woman is to remain single, she is to be under the headship of her father, as her father will decide if she is to be given in marriage. …visit the fatherless and widows in their affliction, and to keep himself unspotted from the world. Two books of the Bible do not mention God: The book of Esther and the Song of Solomon. The book of Esther concerns the rise of a young Jewish woman, who submits to her husband, the King, and replaces the Queen who rebels against her husband. The Song of Solomon describes the sensual love between King Solomon and one of his wives. Both deal with the husband/wife relationship, and no mention of God exists, as that is on another hierarchical level.